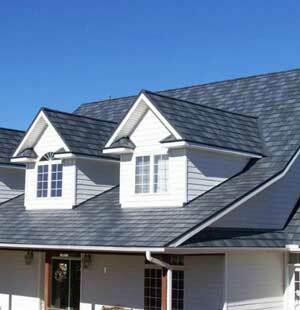 Do you like the look of real slate roofing, but can't afford the high price tag? ArrowLine steel slate roofing from EDCO is less expensive and more durable, while providing the same style and character of traditional stone slate roofing. Plus, EDCO roofing products are backed by the best lifetime warranty in the industry that includes material and labor with hail and fade protection. If you're interested in steel slate roofing for your home, Global Home Improvement is your local professional installer in Doylestown, Ardmore, Cherry Hill and the surrounding area. Call us at 1-855-201-7963 or click below to schedule a consultation and get your free estimate. For this metal slate roof installation in Clayton, DE, we replaced the home's existing 10-year-old shingles. The goal was to replace these asphalt shingles with something stronger and more durable while keeping an authentic look. This made metal slate the perfect choice. Steel slate is made to resist hurricane-level winds, driving rains, and impacts from debris, making it one of the strongest roofing options available. On top of that, the energy efficiency and lifespan is unmatched by any asphalt shingle. For this metal slate roof installation in Avondale, PA, we completely replaced the existing asphalt shingle roof. The home's existing asphalt shingle was just 15 years old when wind began blowing the shingles causing the roof to fail. The homeowner wanted a strong, durable option that could outperform their previous roof; so they chose the metal slate roof with added snow guards. A metal slate roof is the ideal choice for any homeowner looking for a long-lasting roof that will boost their home's energy efficiency and add curb appeal. When we talk about the aesthetics of a Metal Roof it may be hard for some people to understand...However, this before and after of a Metal Slate Roof in Woodstown, NJ makes it quite obvious...METAL ROOFS ARE GORGEOUS! This old farmhouse with its steep roof was in desperate need of a roof upgrade and because the roofline is so dramatic, these customers wanted a roof that would enhance the home's exterior. That is why the called the metal roofing masters at Global and had their home transformed with our 50 Year Metal Slate Roofing. Not only will this roof last a lifetime but it is up to 5 times lighter than real slate and requires virtually no maintenance. After hurricane-level weather hit this home in Gibbstown, NJ, the shingle roof started leaking, pushing these homeowners to install something more durable. These homeowners replaced their asphalt shingles with metal shakes for the significant boost to durability, energy efficiency, and reliability in that they'll hold up in the next storm. The purpose of your roof is to protect your home and if your asphalt shingles can't do that, replacing them is a smart move. This roof replacement in Villanova, PA featured our Edco Arrowline metal slate. The existing 85 year old slate roof was facing minor performance decline as well as fading and color loss that damaged the home's curb appeal. Edco metal slate roofs offer the style of traditional slate without the steep costs and weight putting pressure on the home's foundation. Edco Metal slate is incredibly durable, energy efficiency, and will last on this this home for another lifetime. Founded in 1946, EDCO is leading the siding industry as the single largest manufacturer of siding in the U.S. They specialize in top quality steel & vinyl siding products and are distributed throughout all of North America. EDCO's steel slate roofing product is designed to provide an elegant, historical look that provides unique charm and character to your home. Available in 11 Colors – A wide variety of solid and enhanced colors, one of which is assured to meet your needs. Great Investment – Achieve the look of natural slate for a fraction of the weight and cost. Lightweight – In comparison to natural stone slate, steel eliminates the need to reinforce a roof deck. Unmatched Warranty – Only lifetime, non-prorated limited warranty that includes material and labor. Cool Roof Technology – PVDF finish reflects sunlight and absorbs less heat than typical roofing material. Resistant to Mold and Mildew Growth – PVDF finish includes a non-nutrient for fungal growth. Wind Resistance – Tested to resist wind speeds up to 160 mph. Virtually Maintenance-Free – Will not chip, crack or peel and includes 30-year fade protection. Non-Combustible – Most steel roofing assemblies achieve Class A fire rating, the highest in the industry. Environmentally Friendly – Steel roofing is 100 percent recyclable. To schedule an in-home consultation and free estimate for steel slate roofing installation, contact us today! We offer complete roof replacement and installation services in Ardmore, Doylestown, Cherry Hill and throughout PA, NJ & DE.